The perfect de-icer solution for air lines up to 2 inches. 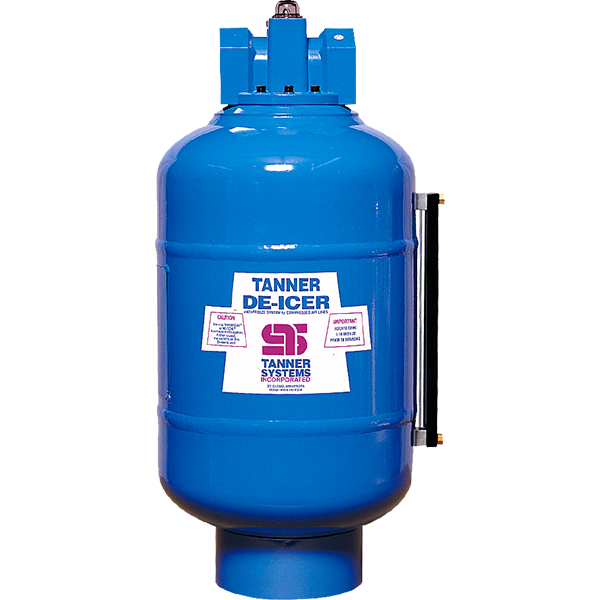 These Tanner dispensers are designed for use in air lines up to two inches and require no electricity. They are of all-metal construction, adjustable to set the de-icant feed rate and are fillable under pressure. 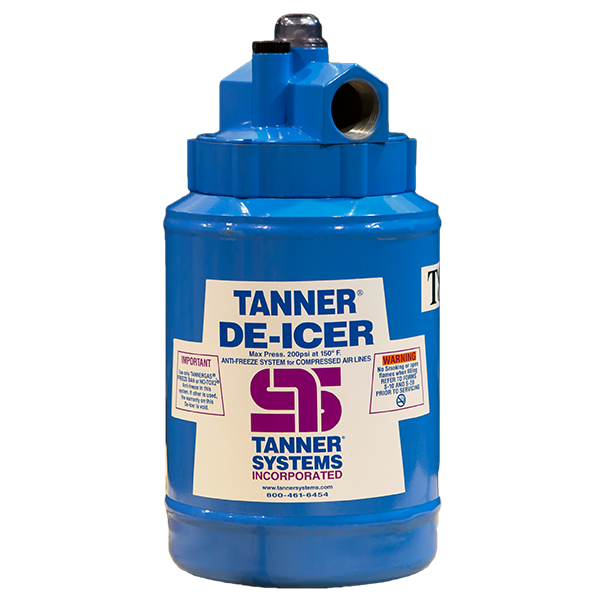 For use only with Tannergas® Freeze-Ban or No-Tox2®. They are truly big dispensers in small packages! Engineered for use with air lines up to two inches. Compact design for easy installation. PLEASE NOTE: Except for the T-90, compact dispensers should not be supported by hoses or pipe alone. The weight or movement could cause damage or cracking to the body of the dispenser. What Tanner Compact Dispenser is right for you? 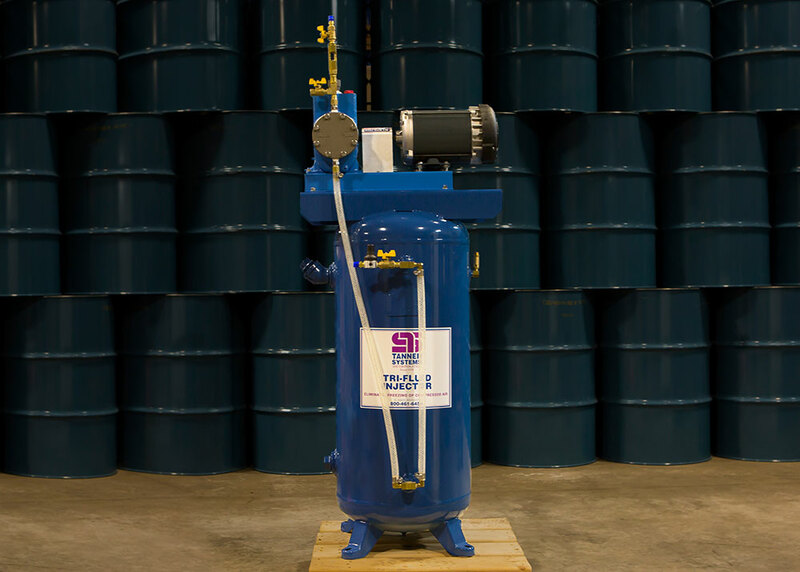 The T-89 is our largest compact dispenser, having an all steel ASME tested reservoir of 5 Gallons. 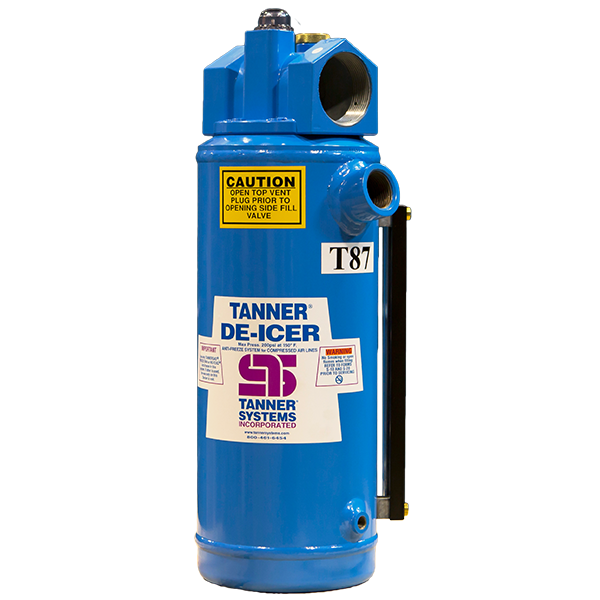 This dispenser treats 1.25″-2″ air lines from 25CFM-1150CFM with maximum air Systems pressure of 200PSIG. Dimensions: height of 24″, diameter of 16.5″, and dry weight of just under 60 pounds. The T-87 is offered to treat larger air lines of 1.25″ – 2″. 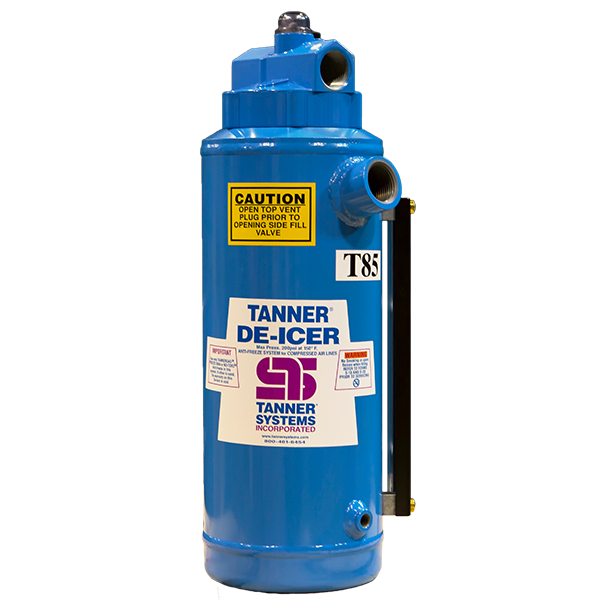 This dispenser can treat from 25-1150CFM with maximum air system pressure of 200 PSIG. It is sized with a 2 gallon tank, and a height of 19″, diameter at 11.5″, and dry weight is 25 pounds. The T-85 treats up to 1″ air lines, and has a 2 gallon tank. Minimum air flow of 3-5 CFM, maximum air flow of 350 CFM, with maximum air system pressure of 200 PSIG. Overall height is 19″, diameter is 11.5″, and dry weight is 25 pounds. 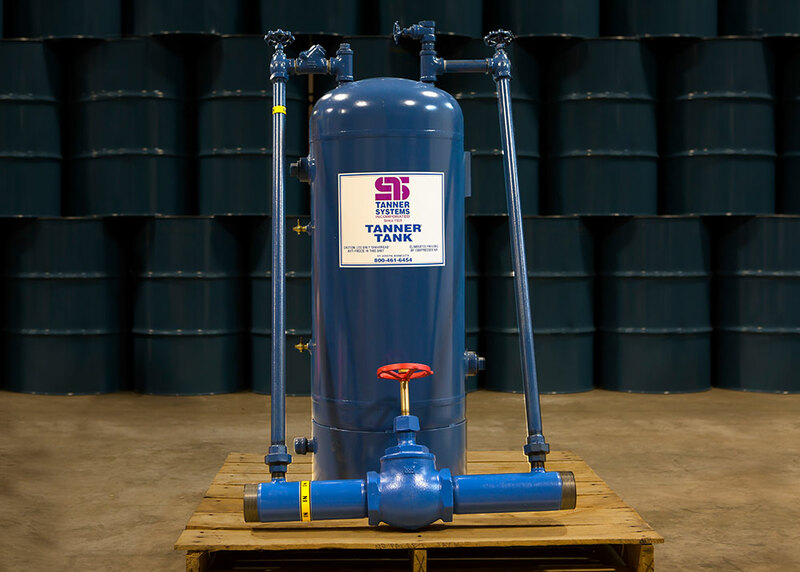 The T-83 treats up to 1″ air lines and is equipped with a 1/2 gallon steel tank. Minimum air flow of 3-5 CFM, maximum at 350 CFM, and pressure up to 200 PSIG. T-83 height is 12″, diameter 7.5″, and dry weight of 16 pounds. The T-90 Compact dispenser has 3/4″ NPT female thread inlet and outlet. The aluminum reservoire holds a quart (32 ounces) of fluid. With a very low minimum air flow of only 3-5 CFM, this dispenser can easily adapt to smaller air lines with just a few reducer bushings. 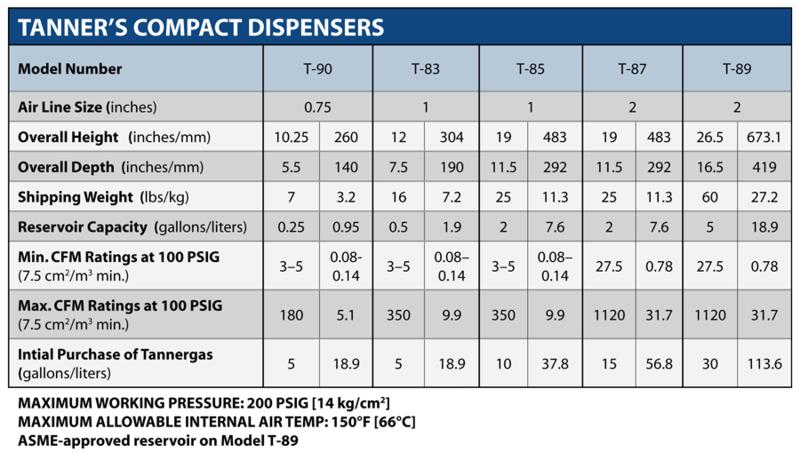 And with its 200 PSIG and 180 scfm maximum capacities, the applications for this dispenser are endless. Dimensions are 10.25″ high and 5.5″ diameter, with a dry weight just under 7 pounds. 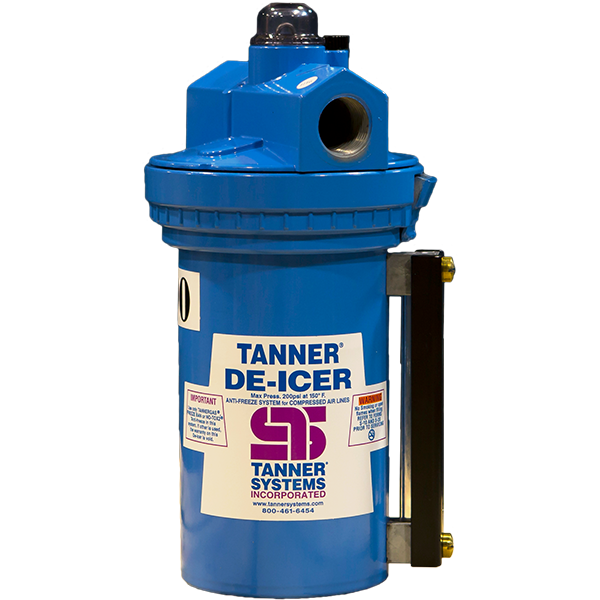 Review our safety data PDF in handling Tanner’s de-icing units. 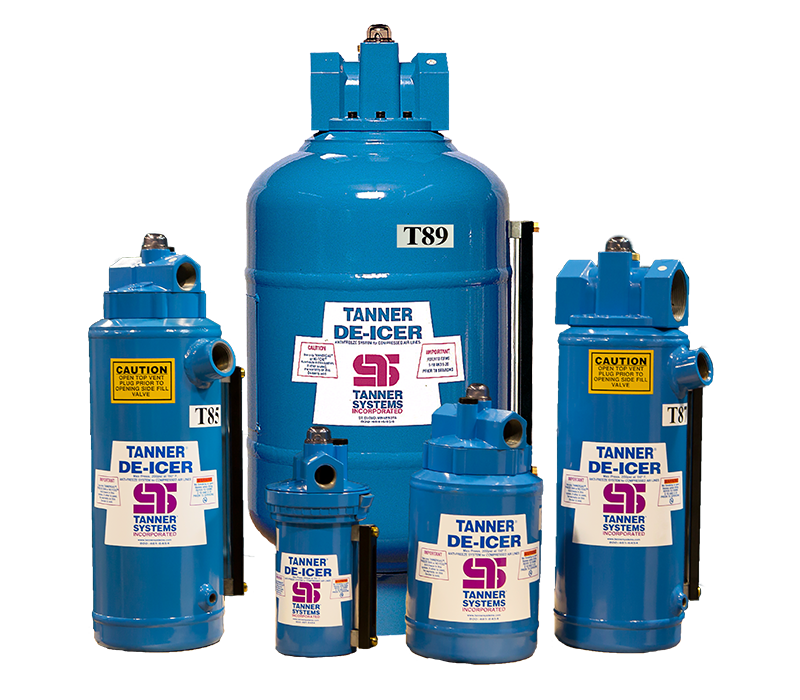 What Tanner System is right for you? Our experienced team members are available to discuss your specific de-icing challenge & can help recommend the best Tanner products to meet your unique operation.